Adams Ranch is a painting of Mt. Sneffels (El. 14,560 ft.) in Colorado. The view is looking east from a vista point south of Ridgeway. Specifically, the view is from where the camera was approximately positioned for the filming of opening scene of the 1968 John Wayne movie True Grit. I call the painting Adams Ranch because that was the name of the site pointed out to me in 2003. The painting was organized from sketches and photographs taken when I was there. 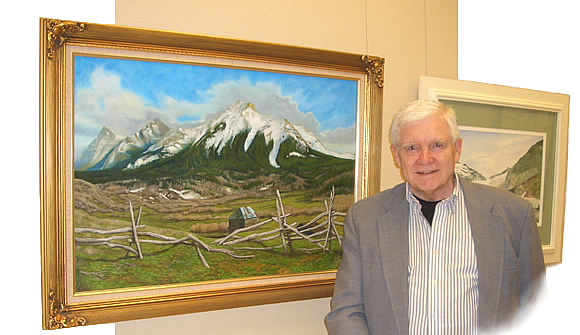 Thanks to Angie Dachs for taking the picture of me with Adams Ranch at a reception for exhibiting artists, the Booth Western Art Museum, June 6 July 30, 2006.